A pretty subdued start to the week, with the broader market closing moderately mixed. 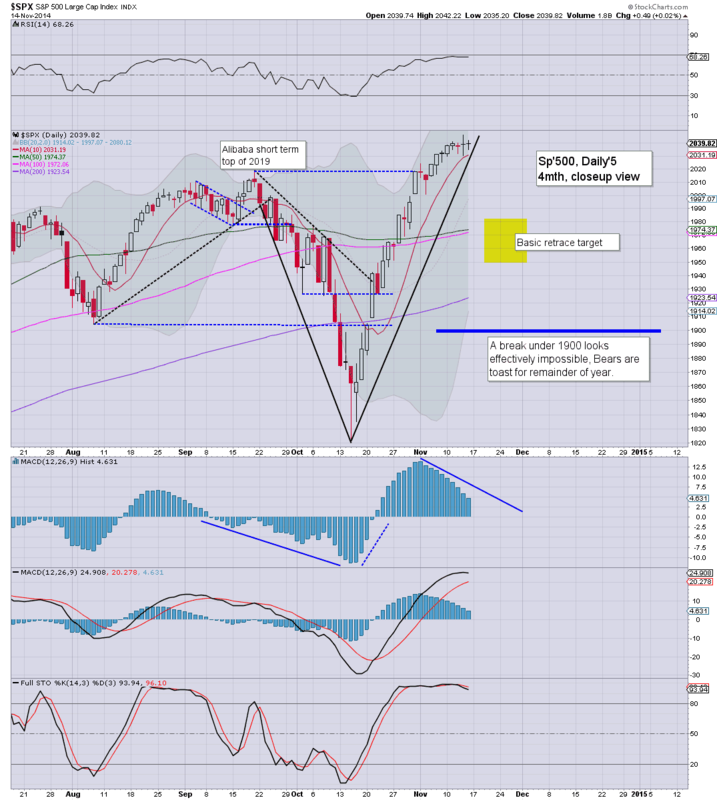 The sp'500 settled +1.4pts @ 2041. The two leaders - Trans/R2K, settled lower by -0.5% and -0.8% respectively. 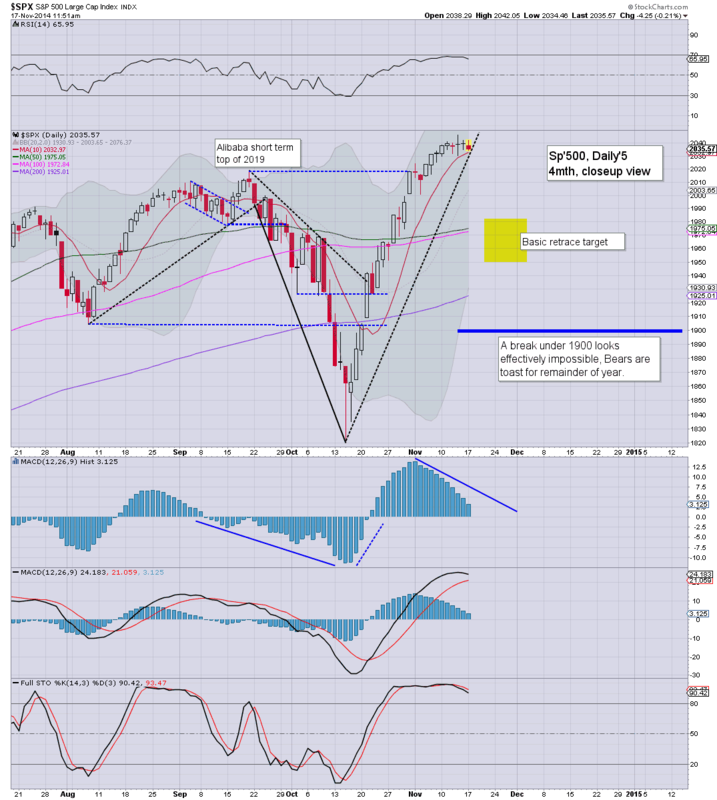 Near term outlook is for a retrace back under sp'2000. Frankly... little to add.. on what was a pretty dull day. The weakness in the two leaders - Trans/R2K, is suggestive the broader market is exhausted - from last Thursday's high of sp'2046. 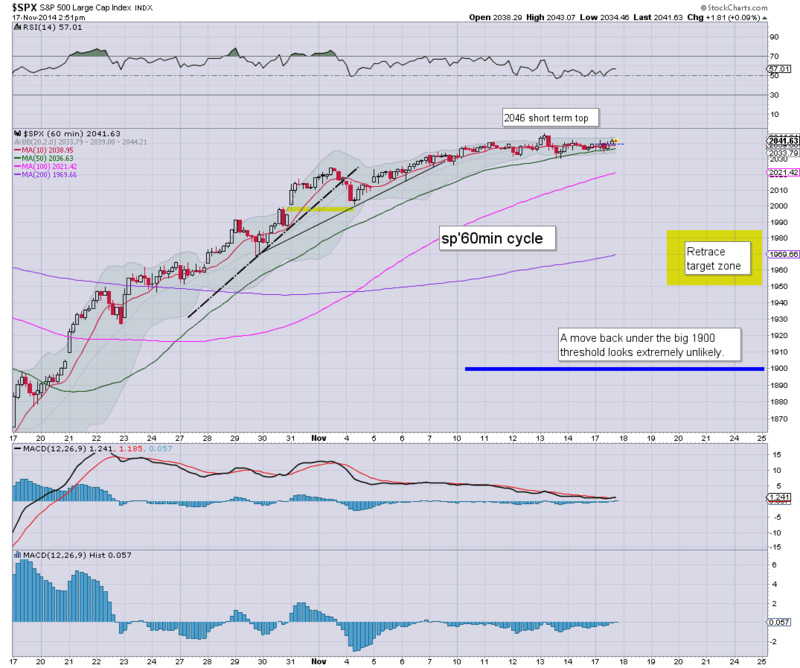 At best, equity bears should be able to manage a retrace into the 1980/50 zone by early December. *a daily wrap at 8pm EST. US equities look set to close with continued mixed weak price chop... with a slight downward pressure - via the daily cycles. Equity bears should look for a VIX close in the 14s, which opens up 16/17s later in the week. Not much to add, a relatively quiet start to the week.. despite Japan getting whacked on what was very poor GDP Q3 data of -1.6% (market was expecting something in the +2.0s). Clearly... the BoJ needs to print a lot more. back at the close... barring a surprise takeover bid... although I'd guess HAL ain't buying anything else this year. Price action remains increasingly light... and dull. VIX is holding minor gains of 5% in the low 14s. The bigger daily index and VIX cycles are both supportive to the equity bulls across this week. Metals and Oil remain broadly weak. Price structure on the VIX hourly is another bull flag - much like last Friday.. even with an opening black-fail candle. Notable strength: Nat' gas +4.6%..building gains across the day. Talk of $5 will be increasing this week. All that is missing are some Russian threats of turning off the gas this winter to the EU. US equities are back to the same tedious micro chop seen in the previous two weeks. VIX is back to melt mode..cooling, now +5.6% in the 14.00s. 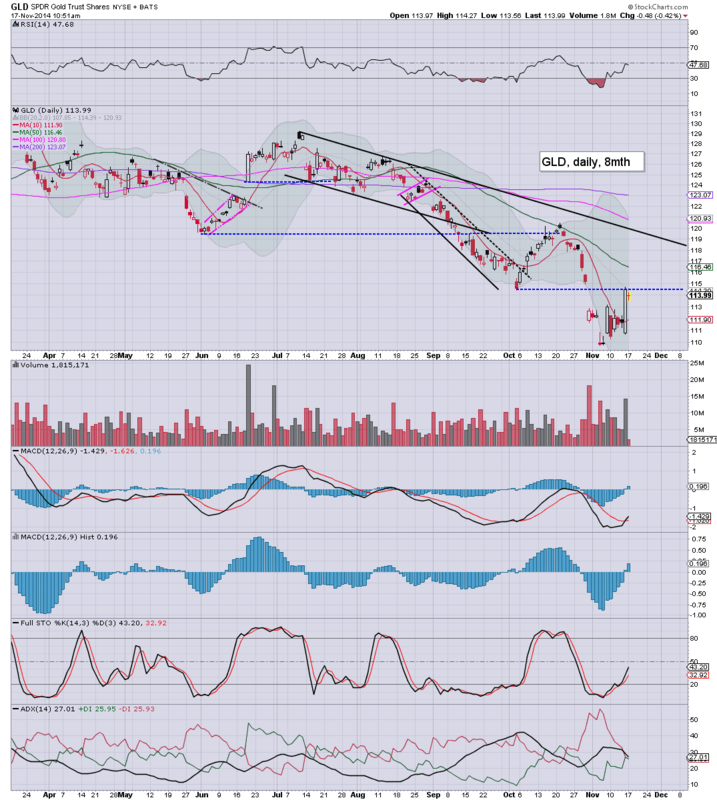 Metals remain weak, Gold -$7, whilst Oil is similarly pressured by a rising USD, -0.9%. Little to add.. on what is again turning rather tedious. 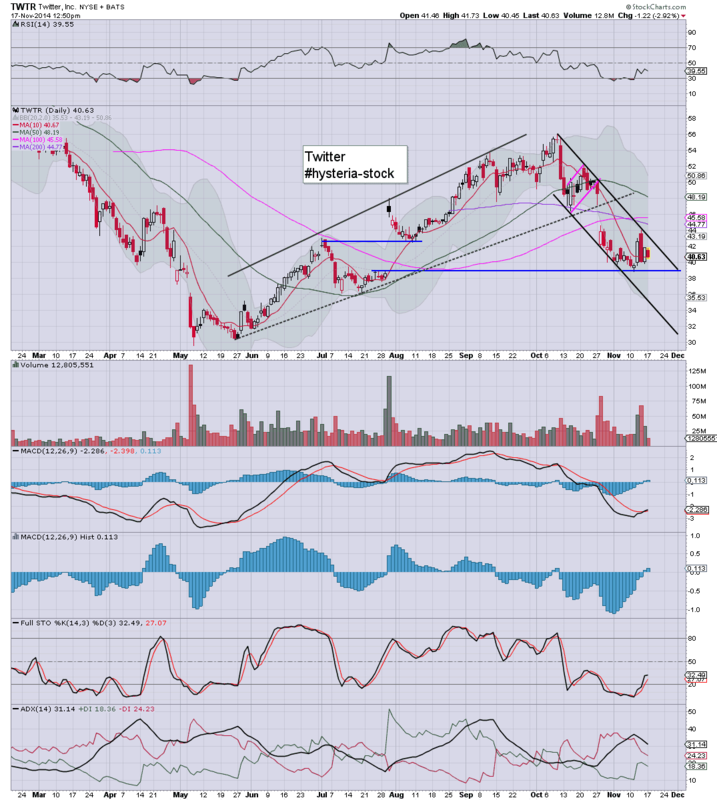 Friday saw a break into the $39s..and that seems likely again.. whether late today..or tomorrow. US equities continue to display a touch of weakness, with most daily index cycles set to turn negative at the Tuesday open. With the higher USD, metals remain weak, Gold -$8, whilst Oil is -1.1%. VIX is holding gains of 8% in the 14.40s. 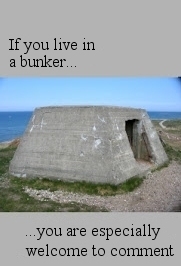 Not much to add. The two leaders - Trans/R2K are leading the way lower, and are highly suggestive that the Thursday peak of sp'2046 is a short term top. Primary downside target zone remains 1980/50.. but that is clearly out of range this week. I'd agree on 'little interest in November', but we're due to turn positive cycle tomorrow... bodes good for the equity bears. 11am update - a case of the Mondays? 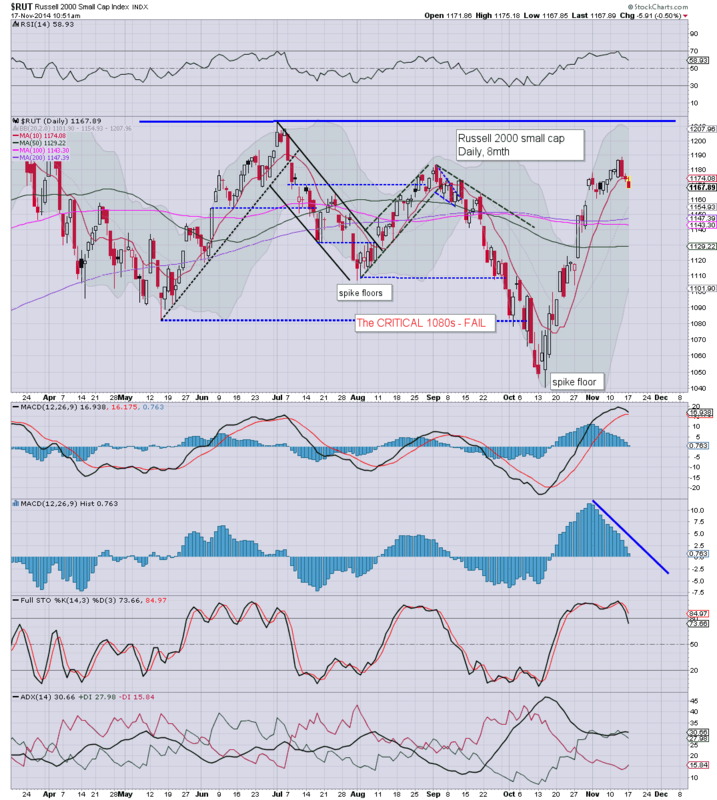 Mr Market remains relatively subdued, but with distinct short term weakness.. lead lower by the two leaders - Trans/R2K. 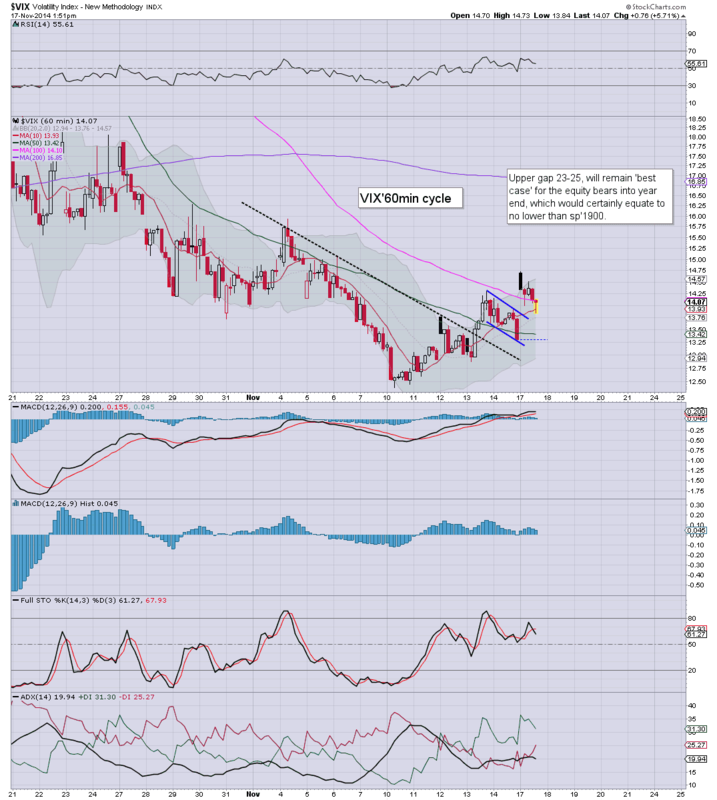 Metals remain weak - not helped by the stronger USD, Gold -$5.. stuck under the old broken floor. *Metals are always interesting to keep an eye on, not least as another round of floor callers appeared this past weekend. Three years.. and they're still at it. Until a few of the bigger gold bug sites shut down... Mr Market has a fair few 'bugs to crush'. Front month cash VIX is holding gains of 7%.. and yes.. as someone noted, the further out VIX is not rising much right now. Even if equity bears do get a retrace in the near term... we're almost certainly not looking at a sustained move over 20.
ps. Did you get the note on the TPS reports today? 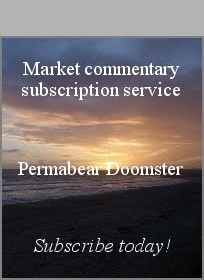 US equities open lower, but so far, its very slight, and there is the threat of indexes turning positive this morning. The rising USD is causing problems in commodity land, Gold -$5, with Oil -0.9%. VIX opened up a full 10%.. so far peaking at 14.73. 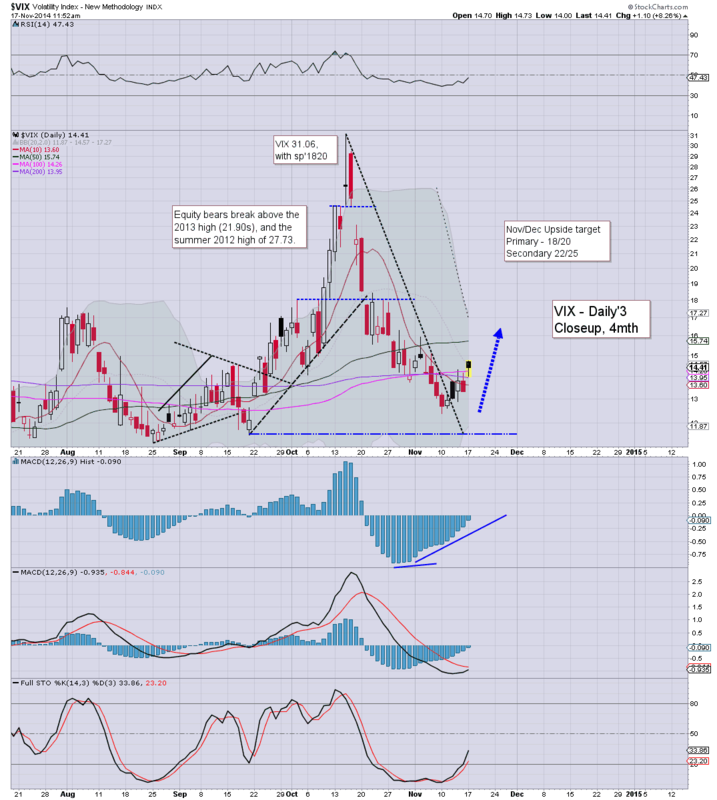 *the opening action in the VIX is somewhat curious.. a daily close in the 15s would really clarify matters. Daily MACD cycle on the VIX.. set to turn positive at the Tuesday open. BHI +9% @ $65, official takeover from HAL.... which will almost certainly go through. In Energy land.. Nat' gas catching a bid.. +2.6%.. so long as it can hold the big $4... viable upside across the winter. Good morning. Futures are moderately lower, sp -4pts, we're set to open at 2035. With the USD clawing higher by 0.2%, the metals are a little lower, Gold -$4. An interesting week is ahead, one where the equity bears might finally start to see a retrace back under sp'2000. A break under the daily 10MA (2031) looks very viable today, and in many ways, that will make for a pretty good warning that a retrace is finally underway. Best guess remains... sp'1980/50 zone by early December. Under no 'reasonable' outlook do I see sub'1900s in the near term. I do agree with Schiff on a great many things, but the USD ain't going anywhere. I wish he could drop that mantra. As any of you regular readers will know, I remain broadly bearish on the precious metals into next year.. and by default.. the miners. Friday was a strong gain, but then.. so was the previous Friday, and that didn't work out so well. *HAL -6%, buy BHI, +11% ... not surprising.. makes me wonder about RIG, SDRL, and indeed.. all of those 'crazy' priced coal/gold/silver/copper miners. 9.32am.. Interesting opening jump in the VIX of 10.4%... almost in the 15s, whilst indexes only a touch lower.